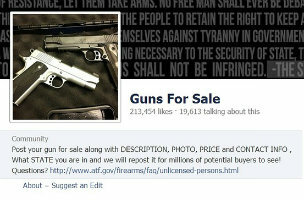 Facebook places limits on gun promotions. CNN sells iPad news app Zite to Flipboard. These stories, and more, in today's Morning Social Media Newsfeed. Facebook on Wednesday announced new restrictions on promoting guns on the social network, amid pressure from groups favoring gun control. In a blog post, Facebook said it would remove offers to illegally sell guns without background checks or across state lines. POLITICO Facebook acted after a six-week online campaign by Moms Demand Action and Mayors Against Illegal Guns, the Michael Bloomberg-funded gun control advocacy organizations, to pressure the social network into pulling its gun advertisements. “On many issues, you make progress in the capital by making progress other places,” said MAIG Chairman John Feinblatt. “This sends a very, very clear cultural signal that a corporation like Facebook is going to in some ways step into the breach that’s been created by Congress.” VentureBeat It’s a concerted effort to stop illicit gun sales from taking place through the hugely popular site — but it wouldn’t have happened without sustained pressure from the activist groups and others. “Facebook has taken real, concrete steps to stop illegal gun sales on their site,” New York attorney general Eric Schneiderman said during a press conference in New York on Wednesday. The New Republic Still, the Facebook announcement shouldn’t be discounted. For one thing, any limits, however small, can have a real impact: among the recent sales traced to a Facebook posting was the sale of a gun by an Ohio man to a 15-year-old Kentucky boy who brought the gun to school. The Wire Instagram, which is owned by Facebook, will also see a shift in policy. Users searching for a hashtag like #GunsForSale will now see a content advisory warning before their search results. As our sister-site TVNewser reported earlier, CNN has sold iPad news app Zite to social magazine application Flipboard after it acquired Zite just three years ago. The deal includes CNN and Flipboard partnering on custom magazines for shows hosted by avid social media user Jake Tapper as well as Fareed Zakaria and John King. Are Vines actually paying off for smaller brands? While Vine’s product lead, Seth Weisfeld, insists that for brands with limited resources creating Vines facilitates compelling content, Digiday points out that they are not easy to assemble. From storyboarding and animation to cross-platform positioning and audio and visual syncing — all before production gets underway — producing Vines is an ambitious exercise. The Securities and Exchange Commission took emergency action against an alleged fraudulent pyramid scheme promoted on Facebook and Twitter. A federal court gave the SEC a court order to freeze the accounts held by Fleet Mutual Wealth and MWF Financial, doing business as Mutual Wealth. Facebook and Google users will soon no longer be able to use credentials from those sites to log in to Yahoo services such as fantasy sports and photo-sharing network Flickr, instead being required to register for Yahoo IDs, Reuters reported. A Yahoo spokeswoman confirmed the move to Reuters, saying that it will roll out gradually. Getty Images, the premiere collection of professional quality photos on the Internet, has for years charged licensing fees to those who wanted access to its extensive portfolio, but that is changing. The image provider has launched an embed tool that allows people to use more than 35 million of the service’s portfolio of images for noncommercial purposes.